"Record of the History of the Imitated (or, False) Bell"
Anonymous, no date. Most probably created by the Kyōto Myōan Temple élite no later than during the early 1670s. 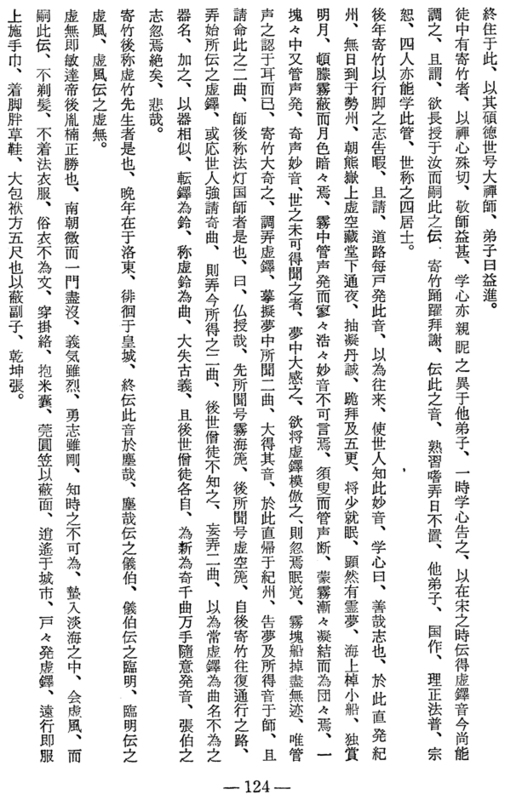 Source: Complete text reprinted in Nakatsuka 1979, pp. 123-125. Yamamoto Morihide, compiler and author: Kyotaku denki kokujikai. Original Kyōto edition published in 1795. 1925 edition publ. by Rakubundō c/o The National Diet Library. 216 pages, Nihon ongaku-sha, Tokyo, 1981. In: Asian Music, Vol. VIII, 2. New York, 1977. OBS: Do note that, most certainly conceived and produced by - and for the benefit of - early komusō of the Kyōto Myōan-ji, the Kyotaku denki text does not mention any "Fuke Sect", Fuke-shū, 普化宗, at all! 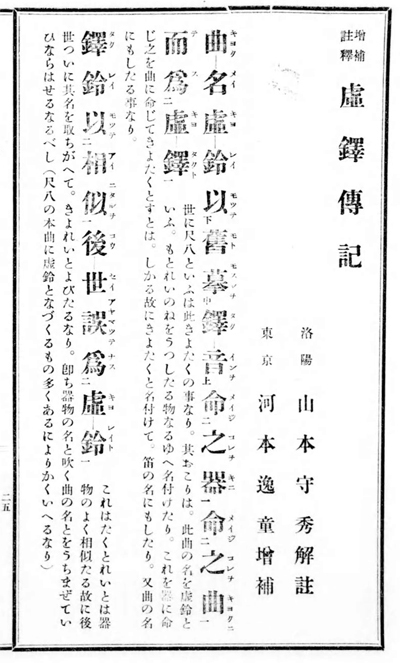 Printed with rendering in common classical Japanese in Kyōto in 1795 - see link to an online copy of that publication in the National Diet Library, Tōkyō, below. 寄竹 - KICHIKU - or, YORITAKE? 三虚霊譜 - SAN-KYOREI-FU - The Three "Empty Spirit Notations"
It is well known that the legend of the Kyotaku, the "imitated bell", has, for long, been regarded as a forgery, or more precisely: A fabrication. There can no more be any doubt that the text was primarily produced for the benefit and strengthened reputation of the Myōan Temple in SE Kyōto. The monk Ton'o, the alleged author of the text, is however reported to have been active during the late Kan'ei period (1624-1644), and judging from the subject matter of the story, it could although but only theoretically, have been composed already at that time. It is, in any case, noteworthy, that central elements of the story about Hottō Kokushi, the four devoted men and Kyochiku (formerly Kichiku, in the Kyotaku denki) were in fact in existence at least in 1735, contained in the Myōan-ji document Kyorei-zan engi narabi-ni sankyorei-fu ben, see below. Kyotaku denki, original text in kanbun. Source: Nakatsuka 1979, pp. 123-125.